You know THAT friend that you had in high school? The one who is clinically insane and can usually do some pretty odd things with his body? Well, this one can burp non-stop, and he wrote an album. Joking tone aside, something akin to that has probably gone through 99% of listener’s heads on their first exposure to the beast that is ‘Nespithe’. To give a basic idea of Demilich’s music for the uninitiated, it is brutal, inhuman, dirty, dissonant, sporadic, dense and just pure crazy. The riffs follow their own ideas of tonality, time signatures and structure (presumably calculated by what they had for dinner or something), resulting in sections which sound like they SHOULD be jarring, but are joined so well onto the next parts that they are saved. A perfect example is in the track (bear with me here) ‘The Planet That Once Used to Absorb Flesh in Order to Achieve Divinity and Immortality (Suffocated to the Flesh That It Desired…)’ (aaaaand breathe…). Listen carefully to background riffs in the first minute of the track and you’ll notice that this idea is taken, then twisted and battered over the whole duration of the song before returning pretty much as it was, but in a different time signature near the end. If you still haven’t stopped snickering at that song name in the previous paragraph, yes, pretty much all of them are that silly. I like to think that they’re not being serious, but your guess is as good as mine. The drumwork on Nespithe is particularly noteworthy; fitting in perfectly (i.e. not at all) with the guitars and vocals with a wide-ranging arsenal of poly-rhythms and technical fills. Blast-beats still feature, but are known to play at cross-rhythms to the guitars to keep things interesting. The one thing wrong with the drums is also one of the only things wrong with the album: the production. The mix is generally poor, with instruments jumping about every now and again1, the drums consistently sitting too low and the vocals always sitting too high. Although this does put more emphasis on Boman’s voice which is arguably the most obviously strange thing about the band, it does detract from the more subtle – but even weirder – interplay between all of the instruments. Another slightly less strong part of the album is the lack of dynamic and speed variations. Pretty much every song is loud and mid-fast paced, which, although contributing to the turn-everything-to-10 approach on the record as a whole, makes it a bit samey after a while with songs melding into one another. 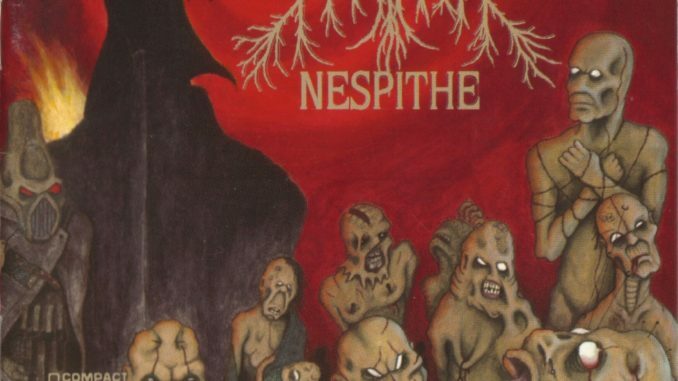 Although not without its faults, Nespithe is an album which has recently garnered much more attention than at its release, and is sure to stay cemented in the minds of many alongside the very best the genre has to offer. Also, the album (and all Demilich’s demos) are available free to download from their website, so you have absolutely no reason not to give it a listen. 1 I know people will argue that this fits in with everything else in the album, but I would argue that this is a purely technical aspect and shouldn’t be brushed aside just because the rest of the album is a bit weird.